John Masterson stands proudly outside of the California State Capitol where he works as a constituent affairs assistant. Photo by Evan E. Duran. A modest brick house surrounded by tall trees in a quiet neighborhood in El Dorado Hills is home to the Mastersons. On a Sunday afternoon, Kathy Masterson and her daughter Meg Masterson, who is over for a weekly visit and a barbecue dinner, work on a jigsaw puzzle in the living room while Kathy’s husband and Meg’s dad Mark Masterson is upstairs watching car racing on TV. The neat and tidy home contains plenty of evidence that the rooms hold many memories of a loving, caring and happy family. Alongside the cheerful photos, mementos of events past and a lifetime’s worth of valued belongings is a driving force, who according to the Mastersons, has not only been the glue that has kept the family together, but is an integral part of who each member of the family is today. On the couch in the living room, near Kathy and Meg, wearing a yellow T-shirt that reads “Best Buddies” and displaying a cheek-to-cheek grin that illuminates the room, sits Kathy and Mark’s son John, who was born with Down syndrome. From being elected Oak Ridge High School homecoming king in 2004, to setting records in power lifting, to becoming friends with former California Gov. Arnold Schwarzenegger, John has achieved more at 29 years old than most people do in a lifetime. Amid the challenges of living with an intellectual disability, John Masterson has pursued and accomplished every one of his dreams. John has held several jobs, graduated from City College and lived on his own. His friends and family say when John sets a goal for himself, he reaches it, and he does so with the enthusiasm of a child opening presents on Christmas. The Masterson family moved from Dallas, Texas—where John was born on Dec. 3, 1985—to many places around the country before settling in their current hometown in 1997. “Yeah! I remember that year! That was back when I was 12,” says John. She explains that Down syndrome affects those with the disorder differently from person to person, and can cause other medical issues. “That doesn’t mean everyone with Down syndrome is the same,” says Kathy. Currently there are approximately 400,000 people living with Down syndrome in the United States. It is regarded as the most common genetic disorder in the nation with one in every 691 babies (6,000 each year) born with the condition, states the National Down Syndrome Society (NDSS) website. However, Mark, who owns and operates Collector Car Garage, a car restoration business, adds that John and others with Down syndrome don’t differ much from the rest of society. John Masterson accepts an award in the 181-pound class, Special Olympian power lifting. Photo courtesy the Masterson family. Throughout John’s school years, Mark and Kathy worked with school personnel and others to make sure that John wasn’t treated differently because of his condition. Because the Mastersons moved around a lot, they experienced opposition at many schools to placing John into mainstream classes. Mark notes that the problem was usually a lack of understanding on the part of the schools about John’s individual abilities and requirements. As parents, he explains, it was important to present the school with feasible ideas about how to help John as opposed to just demanding the schools adapt their programs to the needs of one person. “What we found was that if the school had something already set up, they wanted John to be in it because it was easier for them,” says Mark. John and his family remained positive, and John prevailed in school with the help of classroom aides, modified work and the strong support of his parents. But John’s parents make it clear that John’s personality played a huge role in their success when it came to getting educators—like John’s fifth grade teacher who became an advocate for John after getting to know him during a class trip to the California coast—to meet John’s needs. Mark points out that it was always John’s positive outlook on life that allowed him to not only do everything he’s wanted to do, but to encourage others. Still, the Mastersons struggled to find a program to help John as an adult. But when they heard about the C.K. McClatchy Transitional Program, Kathy and Mark enrolled their son following John’s high school graduation in 2005. The C.K. McClatchy Transitional Program, according to Barry Fallon, one of the advisers, is run out of a duplex near the City College campus. Its goal is to teach young adults living with disabilities, between the ages of 18 and 22, how to live independently. Though it is funded through Sacramento City Unified School District, the program is run in conjunction with City College so that students can take college courses. Classes are held on the main campus, the Outreach Centers or in the duplex itself. In addition to college curriculum, students learn domestic skills and work in various jobs. They also learn how to safely use public transportation and how to budget their money. During his time in the program, John took classes at City College and held several jobs, including working at the City College cafeteria, William Land Golf Course, and in an internship with the Department of Justice. “The classes that John took on campus were relatively limited,” says Kathy as she takes a break from her puzzle to rejoin the conversation. She opens a window and asks if John wants some fresh air. “Yeah, thanks, Mom!” John says with a grin. John agrees that it was tough having to act angry, but he is proud of the outcome of the class. 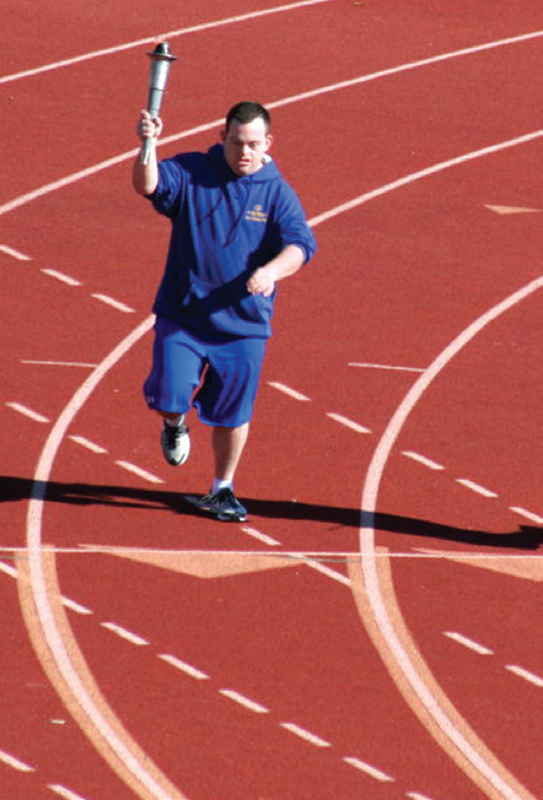 In May 2010, John Masterson carries the Olympic Torch in the Special Olympics Regional Track and Field Meet. Photo courtesy the Masterson family. Following the completion of the program in 2007, John lived in one of the nearby duplexes with his younger sister and City College student Meg. Mark explains that John and Meg lived together for a year, and though it was a challenge for John, it was one of the life goals he wanted to accomplish. But Mark says that for John, the new living arrangement wasn’t all it was cracked up to be. “I think the concept of living alone sounded good on paper, but once he did it, he realized it wasn’t as much fun,” says Mark as he chuckles at John across the table. Because John and Meg had signed a lease, though, John was faced with the reality that he had made a commitment and needed to fulfill it. 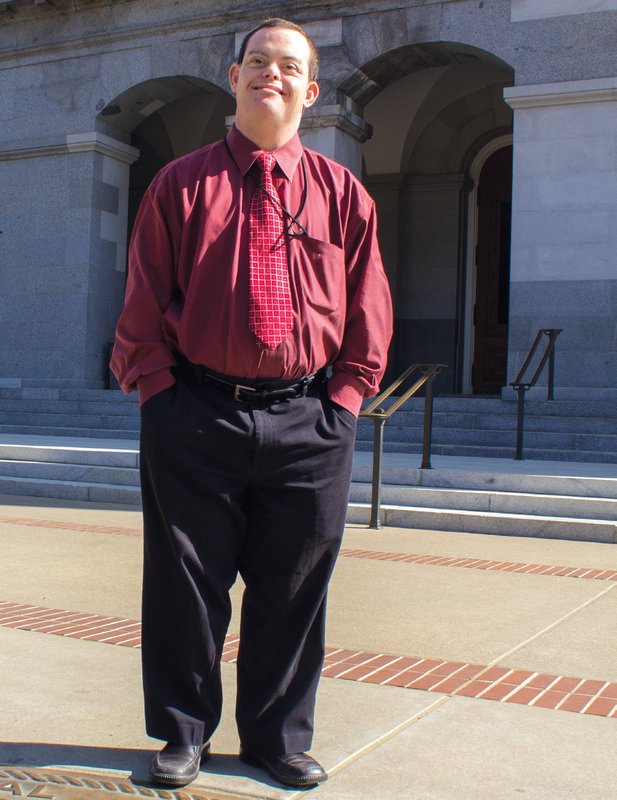 In 2007, through the Transitional Program, John landed an internship working in the California Governor’s office. The internship was through a program called “We Include,” which was started by former California First Lady Maria Shriver and launched officially in 2008. Now called “California Includes,” the program aims “to increase employment of persons with developmental disabilities,” according to its official website. John now works almost a full-time schedule for the Department of Developmental Services as a constituent affairs assistant. Zaharie adds that because of John’s success, the governor’s office continues to work with the Transitional Program today. Many students who participate in the program gain work experience through internships at the DDS. As John’s internship was coming to an end, he and his family were invited to a party at the Capitol to celebrate John’s 22nd birthday, which is when John first heard the news that he was being hired full-time. Because John’s position was appointed by the former governor, his parents were worried that with the transition to Gov. Jerry Brown in 2011, John would be out of a job. John survived the administration change, however, and even received a raise. Trishana Suman, senior constituent affairs representative in the governor’s office and John’s current job coach, says John is a “social butterfly” and enjoys being surrounded by so many people while working at the Capitol. John Masterson not only lifts weights in the World Association of Benchers and deadlifters but also lifts spirits of those around him. Photo courtesy the Masterson family. John says he is very proud of having a job and that he is a hard worker. However, when John isn’t working, he enjoys watching clips from musicals on YouTube, listening to his iPod, competing in weightlifting competitions, and riding bikes to raise money for charity called Best Buddies. “[‘Best Buddies’] purpose is to provide ongoing types of arrangements for people with intellectual disabilities like jobs, promoting friendships, basically doing things promoting self confidence to help them be more active and lead fuller lives,” Mark says. Mark and John have raised about $20,000 for Best Buddies. Mark explains with a chuckle that John has not grasped the concept of riding a bike by himself, but riding a two-person bike has worked out well for them. John also achieved the California state record for Special Olympians in the 181-pound weight class in bench press and deadlift in Chico in March 2013. Jim and Shawna Sheffield started coaching John in power lifting seven years ago, and though lifting was dropped from Special Olympics, they continue training him two days a week. 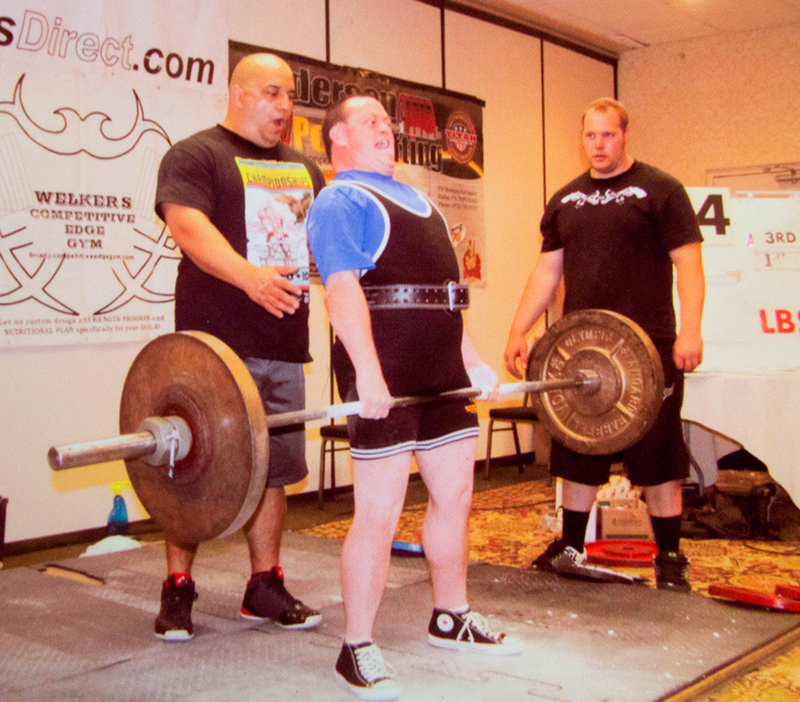 John participates in power lifting competitions through the World Association of Benchers and Deadlifters. 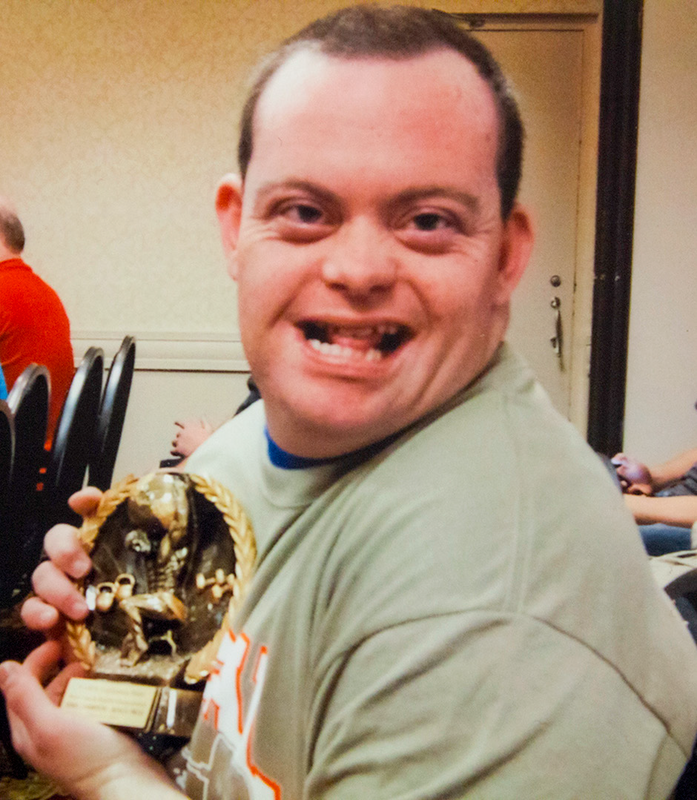 In November 2013, he competed in a world competition in Reno, Nevada where he won a Katana sword for placing first in both bench press and deadlift in the 165-pound special Olympian division weight class with lifts of 170 and 264 pounds, respectively. Shawna says that John tries really hard and pushes himself to do his best. John’s sister Meg says that even if she had the ability to turn back the clock and make it so John didn’t have to live with Down syndrome that, although it would make life easier for John, she probably wouldn’t take the opportunity. For Meg, John is who he is, just as he is. Meg says this is why she calls herself John’s biggest fan and that she wouldn’t change him for the world. This article was awarded third place in the feature profile (magazine) category by the Journalism Association of Community Colleges as announced in April 2014 at the 2014 state conference. This entry was posted in Features, Mainline and tagged california, California Gov. Arnold Schwarzenegger, Jerry Brown, John Masterson, Kathy Masterson, mainline, Mark Masterson, Mastersons, McClatchy, Meg Masterson, Sheffield, Special Olympics, Transition Program. Bookmark the permalink.